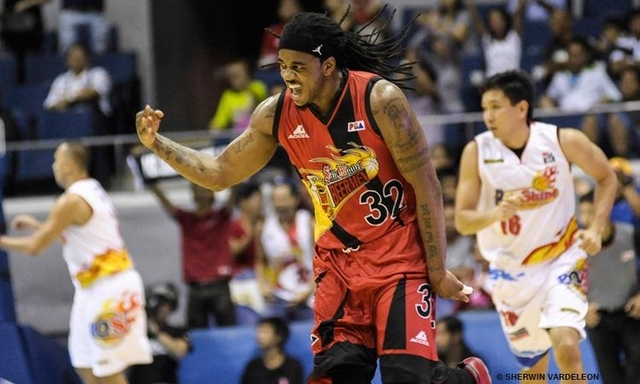 MANILA, Philippines – After blowing out their 20-point lead in game number 2, the San Miguel Beermen (SMB) pocketed the pivotal game 3 of PBA Governors' Cup semi-finals best-of-five series after spoiling Wendell Mckines’ 39 points and the Rain Or Shine Elasto Painters (ROS) 114-108, on Monday, July 6, 2015 at the historic Smart Araneta Coliseum in Cubao, Quezon City. The San Miguel Beermen were all in state of shock after their very frustrating lost against the resilient Rain Or Shine Elasto Painters despite of Marcio Lassiter’s career high of 10 three pointers. It was almost a win for the Beermen. But they forgot to put chains on Wendell McKines who erupted for 53 monster points. Marcio Lassiter who was determined to continue his hot shooting streak fired his first trey but missed. It was McKines who still had stardust in his hands from their sweet victory last Saturday opened the score board with a basket and one plus a three-pointer. Alex Cabagnot who was missing in action on game number 2 looked to replace his co-guard Lassiter in three-point shooting battle, fired 3 consecutive long bombs from downtown with 8 more minutes remaining in the opening period. Gabe Norwood was called for the first technical foul casualty of the game for pushing Arwind Santos whom accidentally elbowed him in the chin off a rebound. Ronald Tubid sank the technical foul shot. Paul Lee matched Alex Cabagnot’s offensive intensity with a 2 for 2 behind the arc. McKines was fouled by Chris Ross under the basket and made both free throws for a 1-point, 27-26 lead after the first 12 minutes of game number 3. ROS Rookie Raymond Almazan got into an early foul trouble for committing all of his 4 first-half fouls on Junmar Fajardo alone under the basket. Worse came to worst, as the lanky center was slapped with a technical foul for continuous complaining. The 2nd quarter was merely a showdown between the two high-scoring imports. Arizona Reid was owning the 3-point area while Wendell McKines remained a strong force in the shaded lane. Reid had 18 and his counterpart, McKines had 24 moving on to the 2nd-half. Beermen were up 56-54. SMB Head Coach Leo Austria still can’t find an antidote for Wendell McKines’ heavy presence underneath the basket. Meanwhile, Arzona Reid sustained his steady outside shooting and Marcio Lassiter started to revive his soft touches on the rainbow country to maintain their lead early in the 3rd period. It was the Painters’ turn to go to the line for the technical free throw as Referee Edward Aquino penalized Arwind Santos for improper bench decorum after Junmar Fajardo gave McKines an elbow to the body before he took a shot. Aquino voided Fajardo’s basket and whistled him for an offensive foul instead. Lefty SMB guard Alex Cabagnot took advantage of Beau Belga’s absence in this game as he sliced through the middle several times and gave his team a 7-point, 89-82 lead after 36 thrilling minutes. Junmar Fajardo was called for his 5th personal for elbowing another ROS player, this time, hard-court heart-rob Chris Tiu was the Kraken’s victim. Coach Austria pulled his prized center out with over 6 minutes in the 4th to save his final personal foul in the crunch time. As the Beermen were losing their lead slowly, “A-Cab” took charge of the scoring duties and successfully brought their margin up, 110-101 with 2 more minutes remaining in the ball game. Cabagnot’s hard work that resulted into 26 markers and 9 dimes paid off with an SMB “W” and Best Player of the Game award for the second time in this series. Coach Austria brought Fajardo back for rebounding purposes as they melted the clock and preserved their lead to avoid another fiasco. The Beermen now lead the series 2-1 and can close out the series this coming Wednesday and book the last finals spot where Coach Alex Compton and his Aces await.